As already discussed in Lagom build philosophy, with Lagom you are free to combine all your services in a single build, or build them individually. Below, we describe how to make a single build containing all your services. The hello sample follows this structure. Then, in the next section, we’ll describe the alternative approach of one build per service. The API project contains the service interface, also known as the descriptor, along with all the data models that the interface uses, e.g. request and response messages. The API project can be depended on and consumed by other services. The implementation project will naturally also depend on the API project, in order to implement it. This system has two services, one called hello, and one called hello-stream. Each service has two sbt projects defined, an API project, hello-api and hello-stream-api, and an implementation project, hello-impl and hello-stream-impl. 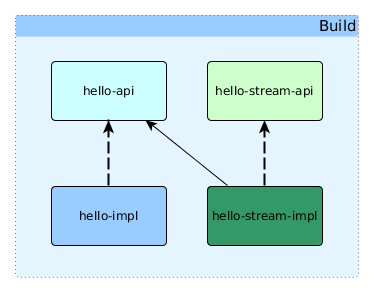 Additionally, hello-stream-impl depends on hello-api, and uses that to invoke calls on hello-stream. // replace 'X.Y.Z' with your preferred version (e.g. '1.2.0-RC2'). The plugin provides all the necessary support for building, running, and deploying your Lagom application. For more information on sbt plugins, see the sbt documentation on Using Plugins. An sbt build is defined in one or more *.sbt files in the build’s root directory. It’s conventional to have a single file named build.sbt; you can split it into multiple files later if it becomes unwieldy. sbt build files are defined using a Scala-based DSL. Simple builds use only a small subset of the DSL, so there’s no need to spend any time learning Scala. If you use an sbt Giter8 to get started, you’ll have a working build from the start. From there, you’ll probably only need to make small edits, or copy-and-paste existing code. scalaVersion in ThisBuild := "2.11.12"
Next we need to define the projects. Recall that each service has at least two projects, API and implementation. First we’ll define the hello-api project. The project is defined to be the hello-api directory, as indicated by project in file("hello-api"). This means all the source code for this project will be under that directory, laid out according to the usual Maven structure (which sbt adopts as well). So our main Scala sources go in hello-api/src/main/scala. The API project didn’t need any plugins enabled, but the implementation project does. Enabling the LagomScala plugin adds necessary settings and dependencies and allows us to run the project in development. The implementation project declares a dependency on the hello-api project, so it can implement the API’s interfaces. Our sample build will include two services, a producer (hello) and a consumer (hello-stream). This is mostly similar to the first service. The main difference is the added dependency on the first service’s API, so the second service can call it. In the next section, we’ll see an alternative build structure where each service has its own build.